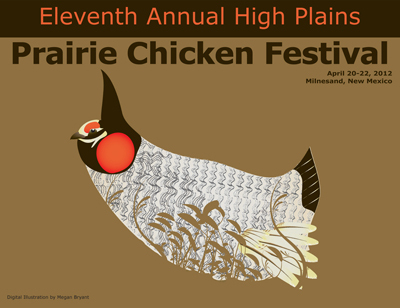 Digital artist Megan Bryant’s striking image of a booming lesser prairie chicken was selected as the winner of the 2012 High Plains Lesser Prairie Chicken Festival poster contest. Bryant, a student at Eastern New Mexico University in Portales, was among about 25 artists who entered this year’s adult category of the contest. As the overall winner, she will receive $300 and her artwork will be reproduced as the annual poster for the festival, which will be April 20-23 this year in Milnesand. 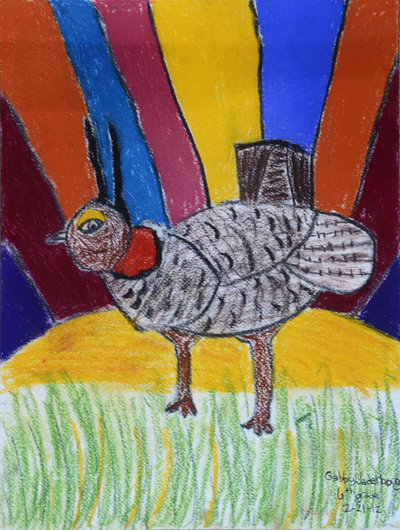 Gabrielle Gaderborg, 11, of Albuquerque, won the category for grades K-6 with her colorful pastel of a booming prairie chicken. 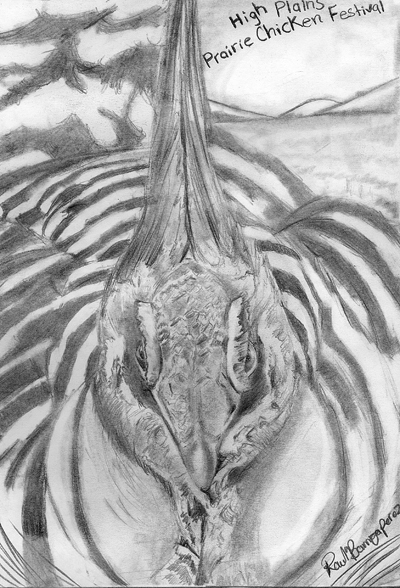 Raul Barriga-Perez of Clovis won the grades 7-12 category with a remarkably detailed pencil drawing of a male prairie chicken. Both youth winners will receive $50 prizes. Sponsored by the New Mexico Department of Game and Fish, The Nature Conservancy, the Milnesand community and other partners, the High Plains Prairie Chicken Festival celebrates the lesser prairie chicken and the Llano Estacado (staked plains) of eastern New Mexico. Festival participants see prairie chickens perform their colorful early morning courtship dances, learn about the cultural and natural history of the southern Great Plains, take dailybirding tours, and enjoy good food and western hospitality. This year’s 11th annual festival is sold out. The festival is limited to 100 participants because of the sensitivity of the lesser prairie chickens during breeding season. Those interested in attending next year’s festival can find information by e-mailing chickenfestival@yahoo.com.